A plea to Congress from the top military and intelligence officials in the United States government would amend a Pentagon spending provision in order to acquire rockets from Russia. US Defense Secretary Ash Carter and Director of National Intelligence James Clapper sent a letter to the chairman of the Senate Armed Services committee this week urging lawmakers to let the Pentagon use rockets that had previously been ordered from Russia but not paid for before a ban went into effect. The letter was dated May 11 and obtained by Reuters ahead of a report published on Wednesday this week. Under the National Defense Authorization Act of 2015, the Department of Defense is prohibited from using rocket engines designed or manufactured in Russia as a result of the country’s annexation of Crimea a year earlier. That restriction has kept the Pentagon from acquiring RD-180 engines that would otherwise power the Atlas 5 launch vehicle, but Carter and Clapper say keeping that provision in place could soon pose big problems. Law requires the Pentagon retains “assured access to space,” Reuters reported, which necessitates that the military has two satellite launch vehicles on the ready so that unexpected setbacks don’t stop the DoD from putting objects into orbit. But United Launch Alliance (ULA), a venture between contractors Lockheed Martin and Boeing which provides those vehicles to the government, says it’s phasing out its US-powered Delta 4 rockets and won’t be ready to deploy its new Vulcan rockets until the next decade. According to Reuters, the lawmakers wrote Sen. John McCain (R-Arizona), the chair of the Armed Services Committee, to say that blocking purchase of Russian rockets would keep ULA from being able to provide options to the Pentagon. 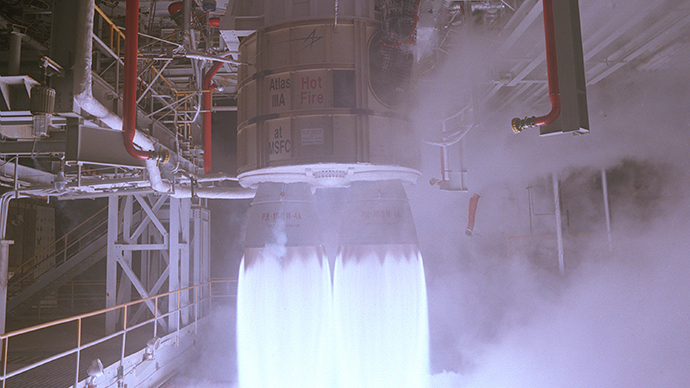 US Air Force Secretary Deborah James said that rewriting the ban would let ULA compete for 18 of 34 competitive launches currently scheduled between now and 2022, and otherwise the group would be limited to applying for only five. Last month, General John Hyten, the head of the US Air Force Space Command, told journalists in Russia that the Pentagon is lobbying Congress to change the NDAA to keep RD-180 engines operational for another four years. Otherwise, current law provides that they be phased out by 2019.